Dave B. sent in this one. "This is a picture of me and my friend Laura. We are both sophomore music majors at the University of Delaware and we both marched drum corps this year. 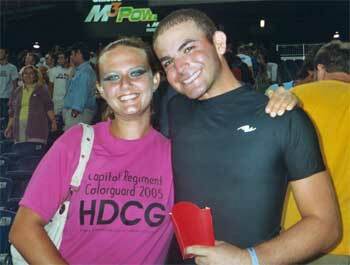 She toured with Capitol Regiment in the guard and I marched mellophone with the Crossmen. After trying to find each other the whole summer on tour, we finally found each other in Foxboro during the ageout ceremony. Needless to say we were pretty relieved! I hope you like the pic." Thanks Dave! E-mail your best shots from the summer to dave@dci.org along with where and when the photo was taken. Send some biographical information about yourself as well. We'll give you full credit. Also, let us know if you want your e-mail address included.